Two titles are on the line at T-Mobile Arena in Las Vegas when the Ultimate Fighting Championship presents UFC 239 on April 7 (AEDT). The PPV event culminates International Fight Week featuring the defending light heavyweight champion Jon Jones up against Thiago Santos, and Amanda Nunes in defense of her women’s bantamweight title against Holly Holm. “In the main event, light heavyweight champion Jones hopes to extend his latest reign at the top when he battles Brazilian power hitter Thiago “Marreta” Santos. And in the co-main event, double champ Amanda Nunes moves back down to 135 pounds to risk her bantamweight crown against former world champion Holly Holm,” reads the announcement. 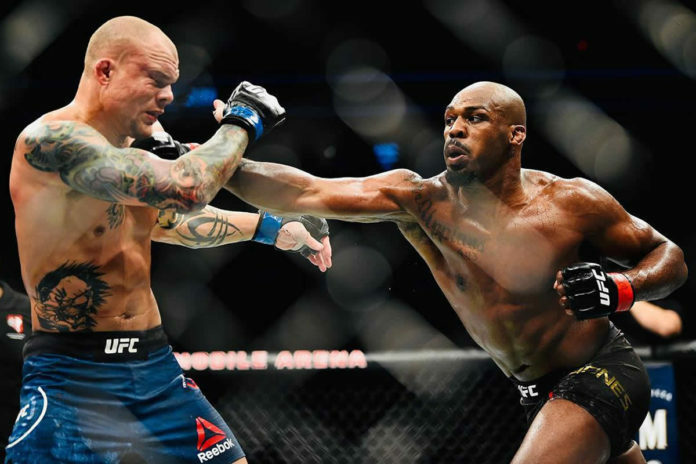 Jones (24-1, 1 NC) regained UFC Light Heavyweight title last December scoring the third-round TKO against Alexander Gustafsson. Early last month he successfully defended the belt earning a unanimous decision against Anthony Smith. Santos (21-6) is riding the four-win streak. He is coming of the third-round stoppage win against Jan Blachowicz. Before that he stopped Jimi Manuwa and Eryk Anders in the second and third round (respectively), and earned a unanimous decision against Kevin Holland. Nunes (17-4) holds both UFC Women’s Featherweight and Bantamweight titles. In her previous outing she knocked Cris Cyborg out in the first round taking the featherweight strap. Facing off Holm Nunes makes her fourth defense of the bantamweight belt, which she has previously retained against Raquel Pennington, Valentina Shevchenko and Ronda Rousey, after becoming a new champion by way of the first-round submission against Miesha Tate. Holm (12-4) is former UFC Women’s Bantamweight champion, who shocked the world in November 2015 when she claimed the title via a devastating head kick against Ronda Rousey. In the following bout she lost the strap against Tate by submission, and then suffered a couple of unanimous decision defeats against Valentina Shevchenko and Germaine de Randamie. Holm bounced back scoring the third-round KO over Bethe Correia in 2017, but then lost against Cyborg, champion at that time, in the featherweight title bout. Nevertheless in her previous outing last June she earned a unanimous decision against Megan Anderson. Among other bouts, the event is also expected to feature a heavyweight battle between Francis Ngannou and Junior dos Santos, and a welterweight showdown between Jorge Masvidal and Ben Askren. The list of announced to date bouts for UFC 239 can be found below.